Gertie's New Blog for Better Sewing: Hello darlings! "Complete, step-by-step instructions showing you how to make smart additions to your wardrobe. You can become an accomplished dressmaker while making clothes you will want to wear." Or so promises the dust jacket of Vogue's New Book for Better Sewing, a fascinating look into home dressmaking in the fifties. According to VNBFBS (hmm, might need a catchier acronym), you can become an expert seamstress, all while making Vogue patterns like "the slim, supple skirt," "the fitted, grey flannel suit," and "the late-day, sheath dress." At the end of the book, not only will you be a sewing genuis, you'll have a fab new wardrobe! I like it. Please follow me while I attempt to become a couture-level seamstress, one project at a time. Please tell me you're going to make the "fitted, grey flannel suit!" Wow, my first comment! The fitted suit is divine, and will have to happen someday. In the fall, perhaps? Thanks for visiting! 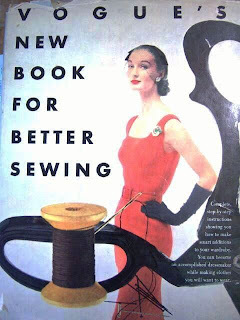 A catchier acronym for Vogue's New Book for Better Sewing? How about VoBBS? (you have to leave out the word 'New', but at least you can say it as one word). Hi, Gertie! I loved your striped sundress entry for Craftsylish. So glad to see that you have a blog now. Found it from Collete, where she's featuring that very cute pink and white confection...er...Parfait! Hello, new friends! Thanks for stopping by. Meg, I like it! Or how about VoNBSS, which you could pronounce as VON-biss? I think this book is gorgeous - just to read, let alone sew. Your goal is terrific! I'll be watching as you work your way through each chapter. At the end, you'll have a complete and fabulous wardrobe, indeed! I know this is an old post, but I love your determination. As I am learning to sew different garments, I become so frustrated! I want results now!! But your one-day-at-a-time attitude reminds me that being good at something takes hard work. I love your blog and your style, and I will continue to follow your posts--I can't wait until your book is out! ;) Thanks for the inspiration. Hi Gertie, Loved your talk at the AADL(Jan 2013). I'm going to start reading your blog at the very beginning. Thinking back of your start with the 1952 version of VoNBSS, I lived the early 1970's version(thanks to Ms. Bort's sewing class at AA Pioneer High School). I'm going to find and purchase the 1952 version(interesting reading for the slow midnights at the AAVA - just kidding, my nursing job is never slow during the winter months - critical illness time). My focus will be to get back to sewing, which I have not done for several years, because of life interference(care of the demented parents). I'm getting excited about being creative again.